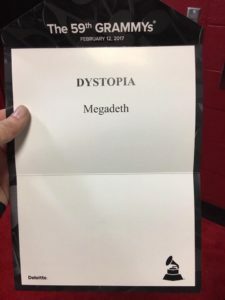 It took 12 nominations, but Megadeth is finally a gammy award-winning band. The iconic band beat out Baroness’ “Shock Me”, Gojira’s “Silvera”, Korn’s “Rotting in Vain”, and Periphery’s “The Price is Wrong” for best Metal Performance. This was Korn’s 10th nomination. Korn took home a Grammy in 2000 for Best Music Video and in 2003 for Best Metal Performance with “Here to Stay”. Both Megadeth and Korn will play this summer at Rock Fest in Cadott, WI. The Festival will include 3 of the “Big 4” thrash metal bands along with Anthrax and headliner Slayer. Headliners Avenged Sevenfold and Rob Zombie will also join the festival with the 2017 Grammy-winners.